A350 XWB News: Airbus starts working with the A350 XWB Configurator, a new tool that provides to the airlines the 3D scenarios for customization based on a catalog of modular solutions. Airbus starts working with the A350 XWB Configurator, a new tool that provides to the airlines the 3D scenarios for customization based on a catalog of modular solutions. 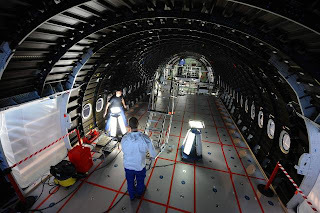 Airbus has introduced a central configuration tool for the A350 XWB program called “A350 XWB Configurator” that has been developed by Berlin engineering software provider PACE and is based on the latest version of their flagship product Pacelab Cabin 7. 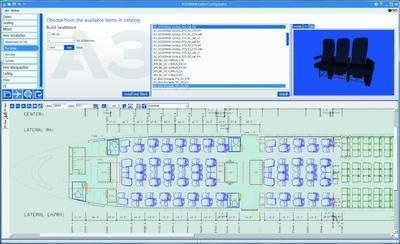 The tool supports Airbus sales, marketing and customer engineering teams in creating airline-specific cabin layouts and aircraft configurations and presenting them in fully rendered 3D, with realistic representations of the selected materials and ambient lighting scenarios. The A350 XWB Configurator ties in with Airbus's new customization concept of offering aircraft buyers an extensive catalog of modular solutions to achieve a significant reduction of lead times. Key assets in this respect are the software's intuitive, highly visual user interface, which facilitates the selection of suitable packages from the catalog; complex compatibility rules, which ensure that only valid configurations are considered; and real-time visualization, which makes it easier for the customer to examine the currently selected options. "As the client-facing side of our customization concept, the A350 XWB Configurator is an important sales and communication tool, which provides all the information airlines need to make a smart purchasing decision," explains Francois Caudron, Airbus Head of A350 Customer & Business Development. "PACE has a proven track record with our company and we welcome their contribution to the A350 XWB customer experience." "We are very proud to have received this vote of confidence from Airbus. We consider their choice a strong validation of our leadership in the cabin configuration domain and of the long-standing relationship between our companies," says PACE managing partner Alexander Schneegans. PACE also works with many airlines –Emirates, Etihad, Lufthansa CityLine, Swiss, Air Berlin- as well as with main manufacturers like Bombardier, Boeing, Embraer, COMAC, Eurocopter, GE Aviation, Rolls-Royce, Superjet and Sukhoi.